To stand out, innovation and creativity are two crucial elements in just about any field. The world of cruising is no different. With cruises getting to be popular among travellers, the operators too have upped their ante, offering new and unique experiences. 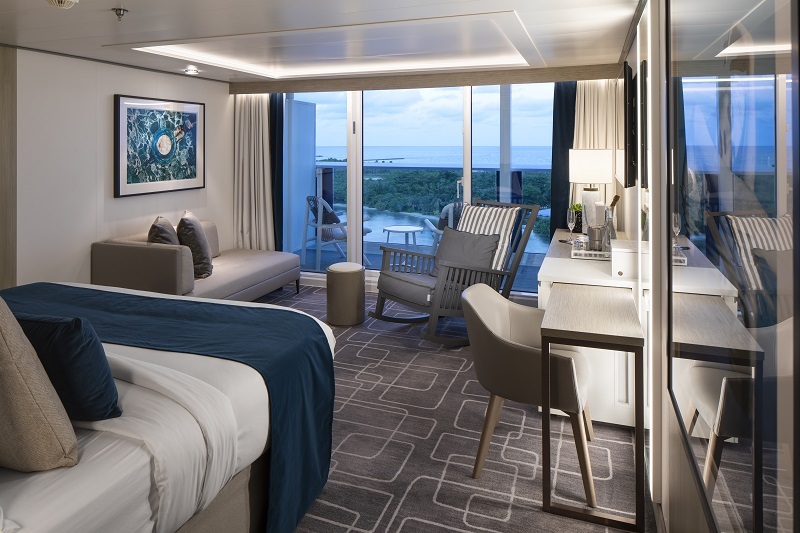 Celebrity Cruises brings an edge to the world of cruising with their newest ship that’s poised to change the way guests experience the world. With its visionary design, the new cruise liner is all set to raise the bar on cruise vacations to even greater heights. Celebrity EdgeSM, the first in Celebrity Cruises’ new class of ships, is designed to leave the future behind. Promising an assortment of firsts for the industry and the world, Celebrity EdgeSM boasts a refined, outward-facing design, new suite categories and iconic, never-before seen stateroom designs. Celebrity EdgeSM is 29,500 GRT, 1,004 feet long and 128 feet wide. Its cruising speed is 22 knots. The innovative cruise ship boasts 14 passenger decks, 12 passenger elevators, and 4 bow thrusters with 4,694 horsepower (3.5MW) each. It can host up to 2,918 guests on double occupancy, 3,373 guests in total and 1,320 crew. The ship has a total number of 1,467 staterooms. Each stateroom is 23% larger in size and the bathrooms are 10% wider than their previous solstice class. Making it easier for family and friends to get away, Celebrity Edge SM boasts their latest category of suites, the two-level Edge Villas, which offer stunning, outward-facing views, private plunge pools and direct walk-out access to The Retreat Sundeck, a convenience reserved exclusively for Edge Villa guests. With two stories of windows in the two-level atrium stairway that look out over the terrace, featuring a three-foot-deep plunge pool and inviting lounge furniture, to the incredible ocean views from even the bathroom, it’s an open and airy environment that truly invites the outside in, and vice versa. Guests staying in an Edge Villa will also enjoy personal butler service and access to The Retreat. Every villa will enjoy a butler service and is fitted with plush king-sized cashmere mattresses that is handcrafted, hypoallergenic, eco-friendly, and eucalyptus-treated. Featuring the first dining venue of its kind is the Magic Carpet restaurant that is perched on the side of the ship and moves up and down between 13 stories. The Magic Carpet makes Celebrity Edge’s distinctive, sleek profile recognizable from miles away. Destination Gateway is a modern, multi-purpose area that brings the destination to life. Destination Gateway will immerse guests in their next destination, with highlights of the port of call displayed on large LCD screens allowing a seamless transition off and on the ship. Moreover, it is a learning and activity center where destination enrichment talks, Celebrity Shore Excursion information sessions, and more are hosted. Business groups and corporate incentive groups can also utilize this space as a modern, state-of-the-art conference room for meetings and presentations.